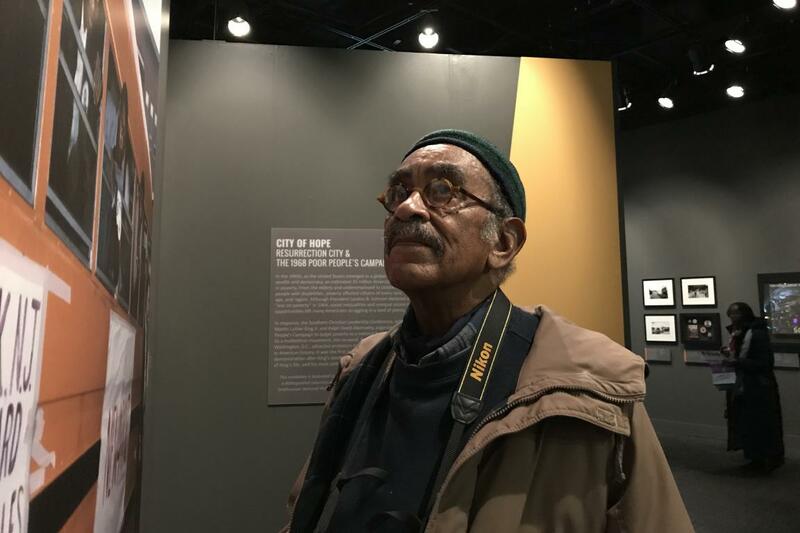 Photographer Robert Houston at the exhibition "City of Hope: Resurrection City & the 1968 Poor People's Campaign"
On a recent winter morning, the air crisp and chilly, Robert Houston is visiting the Smithsonian National Museum of American History. The 82-year-old photographer, inconspicuous in a dark green hat and round tortoise shell glasses, flashes a warm and welcoming smile. The Baltimore-based Houston is on his way to see the exhibition “City of Hope: Resurrection City & the 1968 Poor People’s Campaign,” a collection of newly discovered photographs and videos—many Houston’s own—from the six-week protest for economic justice. What has come to be known as the final mission of Martin Luther King Jr., the Campaign marked a turning point in American history as poverty, and those plagued by it, made national headlines. Houston’s photographs, in particular, revel in the human condition at Resurrection City, the encampment protestors constructed on the National Mall. In one photograph, a woman in a mustard scarf stares out at the viewer from a sea of tent frames, her eyes kind and questioning. In another, a man sits pensively in a rickety tent, his gaze skirting past the viewer’s. Never sentimental, Houston is unabashedly sympathetic to the plight of those pictured as though the photographs were lifted from his own family album. On one occasion, a group of policemen approached Houston in Resurrection City. As he took a few steps back, he glanced over his shoulder to see two hundred protestors behind him, their clenched fists raised defiantly. For Houston, that moment, more than any other, reaffirmed his commitment to the Campaign. Here was a group of people unanimous in their conviction that poverty was too great an ill to ignore, and Houston would make it his mission to bring their plight into sharp relief. Winding through the exhibition, the city’s tents emerge as a recurring theme, with Houston’s images an intimate vantage point into daily life in the city. In one photograph, a woman sits silently, reading a Bible, in another, three children peek out from behind a tent flap, each curious and confident. Houston’s photographs of Resurrection City, framed as they are by sparse wooden structures, serve as singular vignettes, lending nuance to a struggle long resigned to the nation’s margins. In one photograph, a man sits next to a woman holding a child, his eyes downcast, fixed, as they are, on the cigarette in his hand. The woman and child stare into the distance, worry and trepidation coloring their brows. For all their sorrow, though, the people of Resurrection City, as presented in Houston’s photographs, display a singular nobility, an assurance that, though poverty might plague them, a brighter tomorrow awaits. In one of the most striking photographs in the exhibition, a woman sits in a tented alleyway, framed by walls of faded yellow tarp. The only person in the photograph, the woman sits casually, her feet crossed and arm bent, looking out at the viewer with a solemn smile. The large-scale image adds a kind of monumentality to a woman one might gloss over otherwise. Houston is unique among photographers of the Poor People’s Campaign in his unflinching exploration of that defiance, that dignity. In his images, humanity looms large, and concern for others proves far deeper than momentary sensationalism. Robert Houston at the exhibition "City of Hope: Resurrection City & the 1968 Poor People's Campaign"
Perhaps photographer Gordon Parks, Houston’s longtime mentor, put it best when he wrote that Houston’s camera is “guided by his heart.” Parks goes on to describe in an unpublished manuscript how Houston managed to bring out the essence of each and every person he photographed. Please join our live social conversation using #CityOfHope1968.